Bobbin the Robin has been enjoying his camping experience this summer. He has his Keen's, shorts and a cool, sparkling glass of iced tea. Diana did it again! She really knows how to go over the top with just that extra little touch. 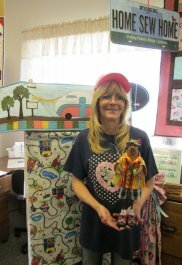 We are entering her into the contest and we are hoping she wins! Here at Valley Fabric we really strive to do our part with recycling. A tip to re-use your paper towel tube. When making your binding and to keep it nicely organized, just take a piece of painters tape or whichever tape you have handy and attach your binding fabric to the tube and wind your binding round the paper towel tube. Presto- All of your friends will know you are 1 organized lady! THEY ARE IN THE STORE! Enjoy and have a safe Labor Day! 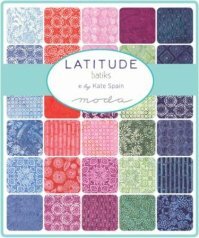 We just received a nice assortment Batiks by Kate Spain. 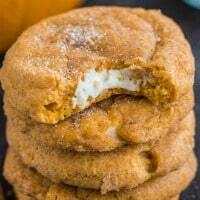 Delicious soft and puffy pumpkin snickerdoodles with a surprise cream cheese center.